A more comfortable exam for you and your patient. Even in difficult scanning positions or when working in tight quarters, Viamo's ergonomic features allow you to acquire the studies you need with more comfort and ease. With greater demands on sonographers than ever before, these features provide the benefits of efficiency and workflow to meet the needs of today's busy clinical settings. Intuitive operation with dynamic touchscreen and dedicated user interface allows for a seamless and comfortable operation of the system. Protocols can be programmed making your routine exams faster with a single screen touch. The Viamo touchscreen functions even while wearing sterile gloves, making this system multi-department functional. Scan with greater comfort and flexibility. Many of our transducers are interchangeable across our systems, providing additional cost efficiencies. Viamo can be a great performer in a variety of roles around your institution. Its small form makes it easy to maneuver, while its powerful imaging makes it a valuable tool in any environment. In crowded areas like the O.R., Viamo's small footprint and premium imaging capability can be the perfect tool. Viamo is designed to embrace open network standards to facilitate easy integration in the widest variety of network environments. 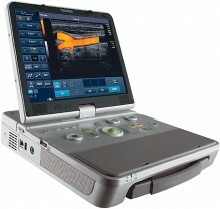 All Toshiba utrasound systems comply with DICOM standards to assure optimum communications between network systems. Additionally, to keep it working well over time, we offer a range of support services our customers have consistently rated best in the industry. 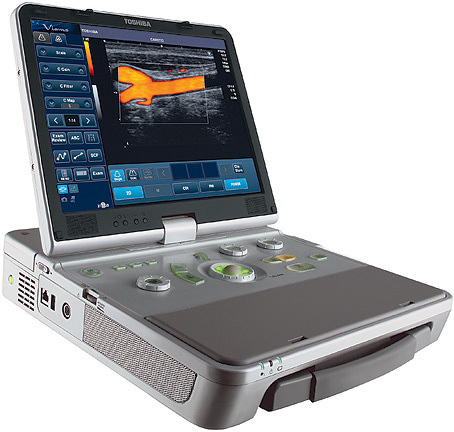 Click the button below to add the Toshiba Viamo Portable Ultrasound to your wish list.